Photo Courtesy Longman & Eagle Longman & Eagle is a Chicago favorite. This 6-room inn masterfully pulls of its self-described aesthetic of "comfort, design consciousness and subtle luxury" as showcased by the rotating art installations that hang on the walls and the in-room accessories, including one room that comes equipped with a vintage Fisher Price cassette player with accompanying mix tapes. As far as food goes, Longman & Eagle's restaurant has earned a Michelin Star seven years and counting and features a "farm to table, nose to tail aesthetic" from Executive Chef Matthew Kerney. Located in Chicago's Logan Square neighborhood at 2657 N. Kedzie Ave., its rooms start at $95 a night. Photo Courtesy Celeste Properties For many, travel is about stepping away from your day-to-day and into someone else's shoes. At Celeste Properties, a celebrity-themed bed and breakfast at 68 E. Cedar St. in Chicago's River North neighborhood, guests can channel the likes of Al Capone (pictured), Audrey Hepburn, Elvis Presley and Elizabeth Taylor. Not only will you be checking into a fully-furnished apartment, each is inspired by the celebrity it's named after. They come with washer and dryer, stocked kitchens and bathrooms, as well as a full dining area. Other perks include in-room iPad, television and stereo. The property also has a common area and back patio with couches and a fire pit for relaxing and mingling with other guests. 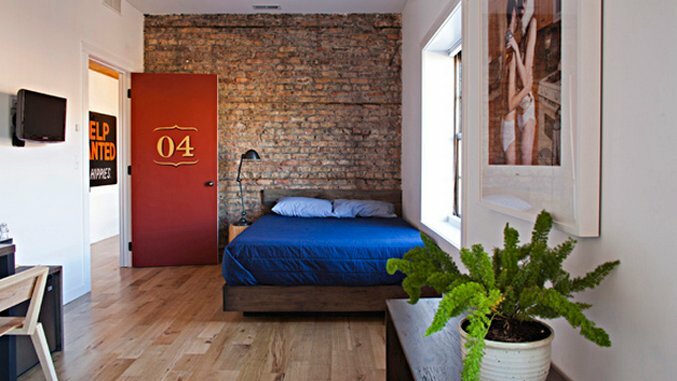 Photo Courtesy The Sono Chicago This boutique bed and breakfast in Chicago's Old Town neighborhood is the epitome of chic. The Sono Chicago, located at 1428 N. Cleveland Ave., perfectly pairs luxury with comfort. Rooms are decorated in neutral shades of grey and feature walk-in showers and a continental breakfast is served each morning in a kitchen that looks like it came straight from the pages of an interior design catalog. One of the best features is the rooftop deck, complete with fire pit and and skyline views of the city. Photo Courtesy Villa D' Citta At Villa D' Citta, guests can stay in an Italian-style villa in the heart of Chicago's Lincoln Park neighborhood at 2230 N. Halsted St. Originally built in 1887, this property has been outfitted to into a luxurious and modern accommodation, complete with a private grotto, sundeck and Jacuzzi, fireplaces, saunas, a theater and fully-stocked gourmet kitchen. As an added bonus, the bed and breakfast offers its own blend of Intelligentsia coffee, a local favorite, roasted especially for Villa D' Citta. As far as food goes, the Villa offers Italian favorites, including stone-fire oven pizzas, tomato and basil frittatas and Italian bread from a local bakery. Photo by Courtesy Wicker Park Inn The Wicker Park Inn, located at 1329 N. Wicker Park Ave. and named after the hip Chicago neighborhood it calls home, offers four rooms with decor inspired by different destinations. There's the ocean blue Cape Cod room with seascapes adorning the walls, the Wicker Park room (pictured) with its exposed brick wall and velvet chaise, the Tuscan room with private entrance to the inn's side yard, as well as the Chicago room with a private outdoor balcony offering views of the city's passing El train. There are also three apartments available to guests looking to stay a while. Rooms start at $149 and include a continental breakfast of croissant sandwiches, fruit pastries, yogurt and more. Photo Courtesy Lang House Lang House occupies a lovely home that dates back to 1919 just off Lake Michigan in Rogers Park at 7421 N. Sheridan Rd. Just like the neighborhood it's located in, the rooms of this bed and breakfast aims to deliver bliss amidst Chicago's bustle. Among the five available, the Stencil Room is an especially worthy mention. The walls feature hand-stenciled designs, large windows that bathe the room in natural light and a bathroom with heated floors, a major perk during Chicago's frigid winters. Photo by Courtesy Ruby Room Inn & Spa At Ruby Room Inn & Spa, relaxation is the modus operandi. The inn's eight rooms are designed to help guests breathe easy during their stay and include 500-thread-count pillows and goose down pillow top mattresses, hardwood floors covered in oversized rugs, as well as marble and glass showers with commercial steam units. There's also a secret garden, complete with a waterfall to help you achieve zen. If all of that doesn't have you in a state of bliss, the Ruby Room's salon, spa or healing services should do the trick. Chicago, like most major cities across the globe, is home to no shortage of world-class hotels. While the big chains occupy well-known addresses and come with all the glitz and glam you’d expect from names like Hyatt and Hilton, they’re not the only top-notch accommodation options Chicago has to offer. The Second City also has a variety of smaller bed and breakfasts you’re more likely to see in a quint rural setting, rather than a major metropolis. The seven on this list offer a unique place to rest your head after taking in all the city has to offer. There’s an Italian-style villa in Lincoln Park, a celebrity-themed option in the Gold Coast and another that shares its space with a tavern that’s earned a Michelin Star seven years and counting.